This year has been particularly bad for colds and the flu. It seems like every germ possible has made its way through the school system and into our home. We wash our hands frequently, cough into our arms and not our hands and eat a healthy diet. But this year there just seems no way to avoid getting sick. When we do start to feel ill we don't normally take medication but instead opt for a natural remedy. Common medications for a sore throat, like Halls, are full of toxins and ingredients that are not good for your health. Have you ever looked to see what exactly is in products for a sore throat? Acesulfame potassium - the sugar free variety of halls will contain this chemical as it is a common sugar substitute. It is actually 200 times sweeter than sugar and is in Halls to make the other ingredients taste better. There have been mixed test results on the safety of acesulfame potassium, even though it is approved by the FDA. Further tests have been recommended to determine if it is a carcinogen. From an environmental perspective, studies have shown that it evades water treatment processes, making it present in water sources. Aspartame - yet another artificial sweetener. While studies say that aspartame is safe at current average consumption levels, it is making its way into a lot of products which is increasing the average daily consumption. Dyes - the colour of dye will vary depending on the flavour of halls selected. The most common are blue and red dye. Both are synthetic dyes that come from petroleum. In Europe, red dye is not recommended to be consumed by children as several studies have linked its consumption to hyperactivity. Isomalt - Oh look! A 3rd sugar substitute. This one is synthesized using a nickel based alloy. Phenylalanine - while it is naturally occurring in the milk of mammals, it is knowing for its antidepressant and analgesic effects. So much so that there is a warning on the package. Sodium carboxymethyl cellulose - a thickening agent that is commonly used in gluten free or low fat foods as well as laundry detergent, paints, toothpaste, diet pills, paper products and is found in drilling mud in the oil industry. Soy lecithin - an emulsifier that comes from crude soy oil which because it is not organic and GMO free, would be full of pesticides and solvents from processing. For natural remedies, I have tried everything in the past, including gargling with salt water, hot tea with ginger and turmeric, hot tea with honey, and drinking lots of fluids. The results were always mixed. When I started to get a sore throat early this week I decided to try something different. There is nothing worse than having a cold when the weather is nice, so here is how to combat it naturally so you can get back to enjoying sunny days. What you need - water and lemon essential oil. Yes, it is that simple. In fact, simpler than going to the store to grab medicine. At the first sign of a sore throat, grab a reusable water bottle and fill it with water and add 4 drops of lemon essential oil. I drank 3 of these in a 24 hour period and my sore throat was completely gone. Unlike other natural methods I have tried, it didn't come back a day or so later. 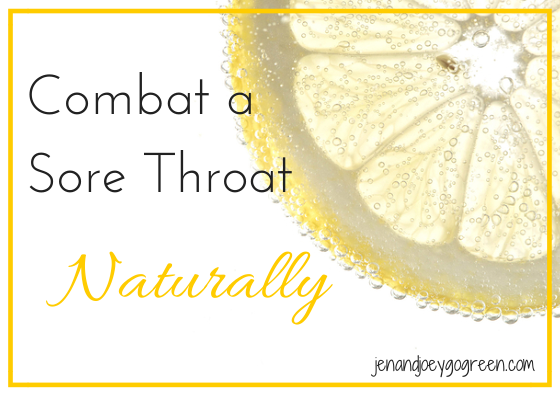 What natural methods do you use to combat a sore throat? I've been fighting a sore throat all week and I absolutely hate gargling salt water--I'll definitely have to try out this remedy! I have my fingers crossed. Thanks for sharing! I hate gargling salt water too. I have never ever found that it works. Well, that makes sense ... I've always heard that the peel of lemons (where the oil comes from) is loaded with vitamins and nutrients ... so your lemon water would be loaded with good stuff. I usually start drinking ginger tea when I feel a cold coming on. I steep raw ginger in hot water and then add a splash of lemon. Next time, I'm adding lemon essential oil and then I'll also put it in my water. Thanks for the great tip! Do you leave the ginger in large chunks? I have been grating mine into tea with turmeric. I always freeze my ginger and then either grate it or slice it very thinly. I make hot ginger tea with 20 thin slices of fresh ginger in a pot of water simmered for 20 minutes -- then add honey -- helps tons! ;) It's good cold too!